January 1959, Fidel Castro comes to power; within days the United States recognises the new Cuban government. Hey you – you in the peaked cap and beard. Don’t I know you? Not me Yankee! Spring-themed four horn septet, each a bluesy romp, with fine alto solos from Cannonball Adderley, and Cecil Payne on Bari. Not ground breaking, but everyone swinging, having a good blues jam. Glad we got that explanation over with. “Phantom speaker” indeed. That would be the mono one. 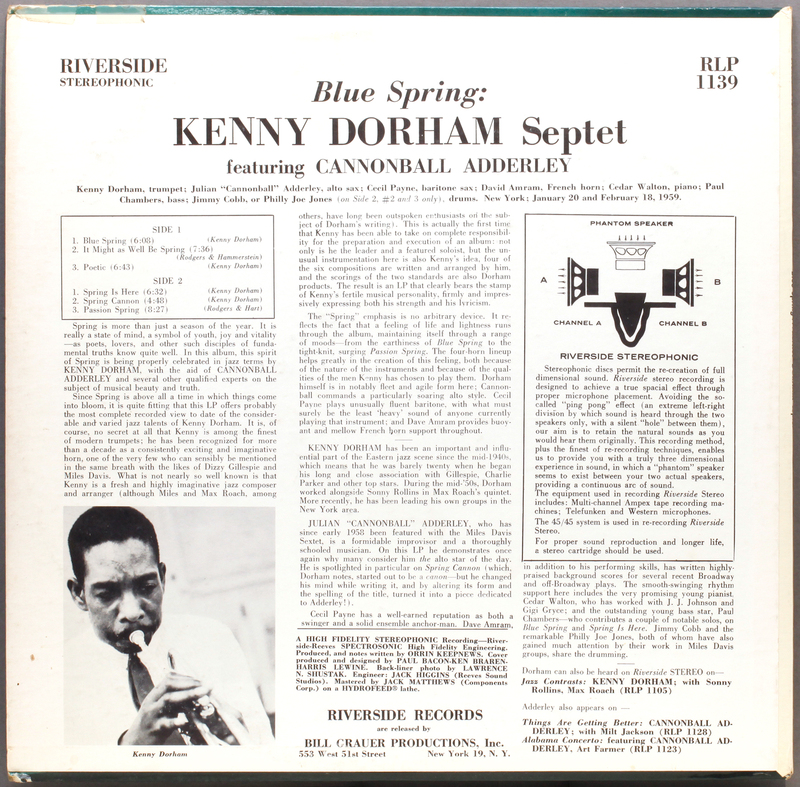 Blue Spring is a US pressing, deep groove, with faint, hardly readable matrix engraving. 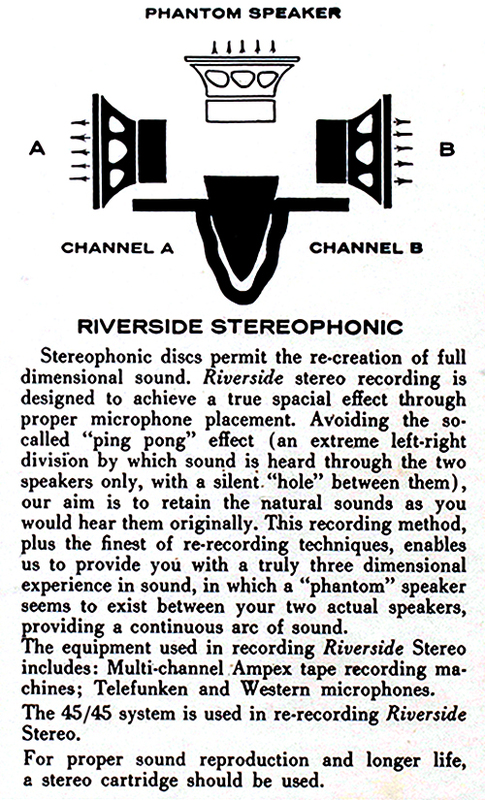 Riverside Stereo is quite rare here in the UK, having just the one stereo out of thirty Interdisk UK Riverside releases, the remainder, all Phantom Speaker mono. Well, that description didn’t take long. With no photo of the label provided, a case of bidding blind, and asking no questions that might raise further interest. An unexpected number of bids for this modestly described auction appeared. Another sniper emerged in the closing seconds, and I felt bad about seeing off the bidder who had put in eight separate bids, escalating the price a pound at a time, a strategy I am totally unable to fathom or explain, other than the bidder suffering a slightly worrying addiction to pressing buttons. 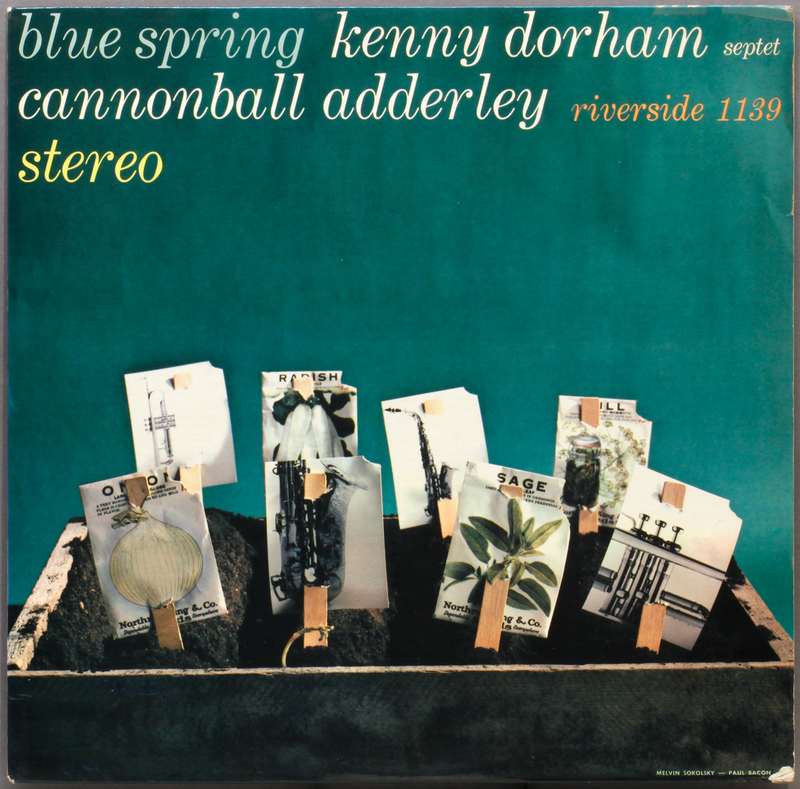 This entry was posted in Cannonball Adderley, Kenny Dorham, Riverside and tagged Cannonball Adderley, Cecil Payne, Cedar Walton, Dave Amram, Kenny Dorham, Paul Chambers, Philly Joe Jones, Riverside, Stereo by LondonJazzCollector. Bookmark the permalink. What an extraordinary record, so pleasingly different from your (my, our…) regular hard bop fare! Arrangements that are both clever and beautiful, top-notch recording (it’s Paul Chambers, most prominently, who is much better served here than by RVG! ), and a truly magisterial Cannonball. The only disappointment is in Cecil Payne’s solo work, who nevertheless is essential to the full-bodied group sound. I never knew if I had an original stereo or not with my copy. Same cover as yours and its laminated old skool style. Cut off corner with a square “APPROVED” Stamp in the back. The “Blue Spring:” Is a lot smaller than your copy. Mine starts off at the end of the y on Kenny and ends at the “M” of Dorham. Deadwax reads “RI”, two Weird looking “L” making a shape of a box and RLP 12-1139. Only paid 11 bucks for it so I thought it might be a reissue. The whole Mono/Stereo debate is a bit of a non issue here. What stands out for me is how far behind Van Gelder so many other recordings where. They simply do not compete with the Van Gelder close-miking at the time. Riverside (both mono AND stereo) sound distant and un-engaging. Only Contemporary and Columbia were on a similar level. Excellent record, here at Chez Matty only on CD though. “Spring Cannon” is a favourite and to fan the fire a bit more: I don’t mind the “extreme hole in the middle” stereo at all. If you listen carefully you can hear some of the left audio far away on the right side and vice versa of course. Comments here on “Stereo” are dangerous Matty. You did well not to use the incendiary word “fold-down”. You might just get away with the idea of” bleeding holes” but I recommend a tin helmet and keep working on the Karate defence moves, as you never know with these sound engineers. Gentlemen, the floor is yours. Nice music – typically “whole in the middle” early stereo – not too great on headphones. Nice conditon for a “Very Good LP”. I would not have dared to bid on this LP with such a description. Why was there so many bids? 14 bids, with eight from one individual. The price shot up to – well I dont mind admitting it on this one occasion – to £17 , which I thought was fair enough for a gamble and a curio. The stereo is primitive – or my gear doesn’t have a phantom speaker. Its quite an enjoyable uncomplicated record, and I like all the people playing on it. 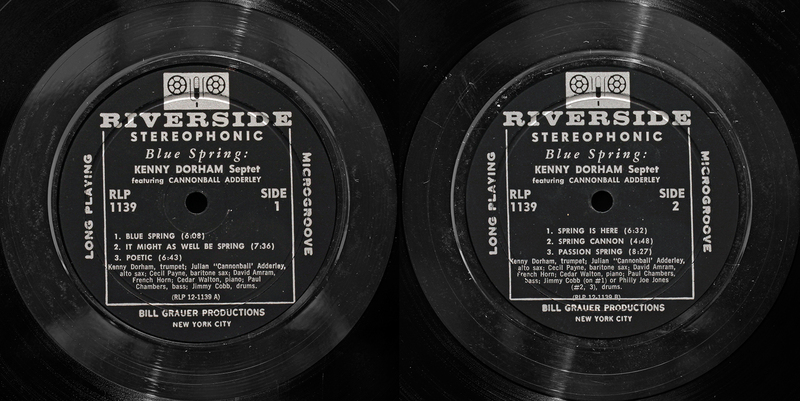 US Riversides are not anywhere near as nice pressing as the Decca and Philips pressed UK ones. Lesson learned. Dear LJC, I humbly apologize for renewed carping… but your Numark still seems to be running 3 percent sharp. By the way, the indentations round the rim of the turntable – crude as they may seem – work perfectly as a strobe gauge for 33,3 RPM. I am almost certain they will remain “stationary” if you slow down by 3 percent. “Passion Spring” should be in C major when played on your high-end turntable. Here, it’s somewhere between C and C sharp. Thanks – in this case a fair price.